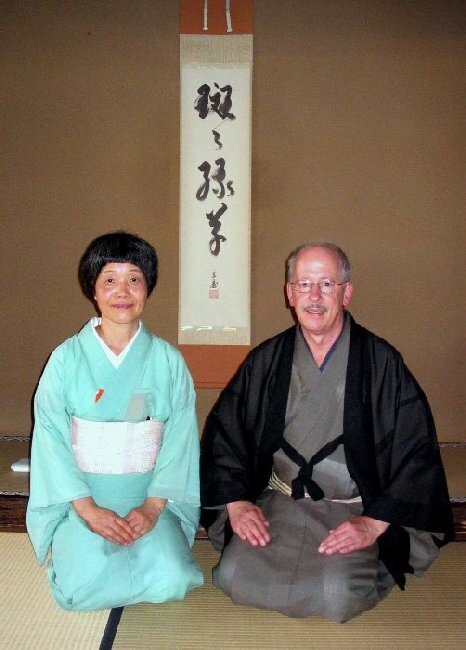 Kimika Soko Takechi & Larry Sokyo Tiscornia are long time instructors of the traditional Japanese art of Chanoyu, the tea ceremony. They teach Chanoyu and its many related arts in San Francisco, California, and travel to many places sharing their knowledge with others. They also lecture and give demonstrations at both public and private schools as well as colleges and universities. They received their professional tea names in 1985 from Sen Soshitsu XV, the now retired head tea master of the Urasenke School of Tea, in Kyoto, Japan. The name Soko translates to "fragrance" and Sokyo to "bridge" and both received the Junkyoju, associate professor, degree from the Urasenke School in 1994. Kimika is from Iyo City, in Shikoku, Japan, and came to the U.S. in 1975 to study English at both Holy Names College and the University of San Francisco. She graduated from City College of S.F. and has also taken classes at S.F. State University. She worked as an artist in traditional Kimono design in Kyoto and has been studying and teaching tea for 40 years. She is also an accomplished artist specializing in watercolors. Larry, a San Francisco native, attended both City College of San Francisco and Los Angeles. He has been interested in traditional Japanese arts for many years and owned and operated one of the first Sushi restaurants in S.F. in 1974. He began his tea study in 1976 and trained for 6 years at the Urasenke Tea School headquarters in Kyoto from 1979 to 1985. He graduated from both the international division and the professional Japanese division of the school. He returned to S.F. in 1985 as a tea instructor at the Urasenke Foundation of S.F until 1988. Since then he and Kimika have been teaching Urasenke Chanoyu privately in San Francisco and share the joy of tea with many. To receive more information please Email them in San Francisco.